Beer Brewers Test A Taboo, Recycling Water After It Was Used In Homes : The Two-Way When a brewery made a beer made from recycled water, at least one headline asked, "Would You Drink It?" After trying it, San Diego Mayor Kevin Faulconer declared the Full Circle Pale Ale "fantastic." There are beers that can make headlines simply by existing, especially if they use unique ingredients. That's the case with Stone Brewing's Full Circle Pale Ale, whose key component — water — came from an advanced filtration system that recycles and purifies San Diego wastewater that had previously been used in taps, toilets and showers. The beer is like many other modern pale ales, Stone says, with a rich caramel body underpinning the hops' floral, fruity notes. It was brewed to be "refreshingly clean," the brewer says, and was declared "fantastic" by San Diego Mayor Kevin Faulconer. "I thought it was excellent," said Tim Suydam, Stone's senior water operations manager. "I thought it was a great beer." For a batch of beer that was only around five half-barrels and was limited to a special event for San Diego's recycled water campaign, "there is an amazing amount of interest in this story," says Stone representative Colleen Gatlin. And that includes both the media and beer fans. "We've had a lot of people asking, 'How do we get it?' " Gatlin says. Stone Brewing's Full Circle Pale Ale — not seen in this photo — was made with water from an advanced filtration system that recycles and purifies San Diego's wastewater. This image was taken at the Stone Brewing World Bistro and Gardens. Suydam oversaw a large part of Stone's project, which began as a way for city leaders to show the merits of its Pure Water demonstration facility in San Diego, which plans to use recycled water for one-third of its water supply within the next 20 years. Stone wasn't alone in using recycled water to make beer. 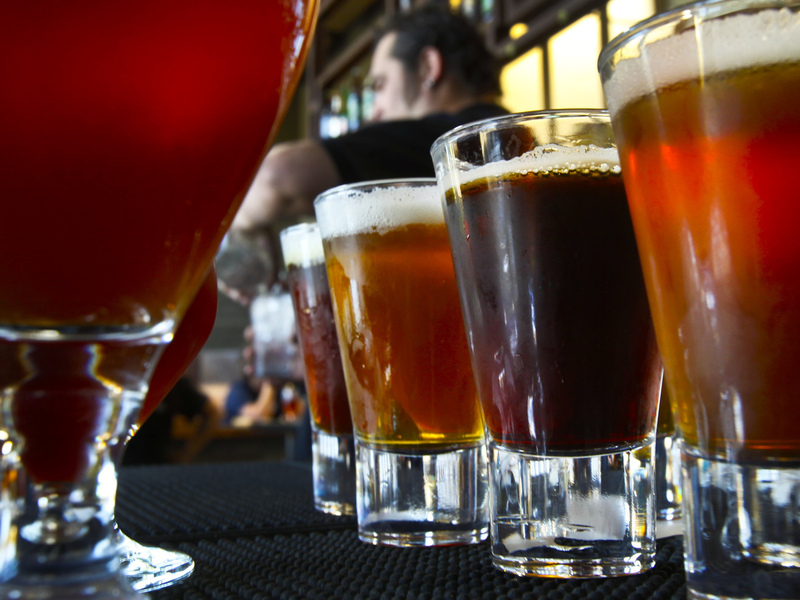 Timed to coincide with this week's World Water Day and the WateReuse California Annual Conference, San Diego also held a "Pure Brew" competition for homebrewers using its reclaimed water. Also this week, Ballast Point, another large and respected brewer in the area, released Padre Dam Pilsner, which it made with water that was recycled at a similar demonstration facility in neighboring East County. "It starts off with what we call Title 22 water. The water is secondary effluent from a wastewater treatment plant, and it goes through ... media filters, similar to what would be at a regular water treatment plant. And then it goes through a whole host of additional treatments, so that the water that comes out the back end is very high quality — it's better than what comes out of the tap. "It goes through ozonation. It goes through biologically active carbon contactors, and it goes through microfiltration, which is a membrane filtration process. Then it goes through reverse osmosis, then it goes through UV chemical oxidation." Finally, Suydam said, "Because that water is so pure, they add some minerals back to it, so it won't corrode the pipes as they distribute it." But many people — perhaps forgetting that most water we encounter has a complex and decidedly organic past — seem to be fixated on the provenance of Full Circle's water. Even as they acknowledged the beer's quality, some news outlets seemed to have trouble getting past the water: Sample headlines include, "Stone Brewing Creates 'Toilet to Tap' Sewer Beer" and "This Brewery Is Making Beer Out Of Poop Water, And It's 'Delicious.' " Another asked, "Would You Drink It?" The current plan to make beer from recycled water dates to at least 2015, when concerns about drought and California's water supply were making headlines. That same year, a wastewater company in Oregon began working with brewers in the Portland area with the aim of testing a similar project. Asked how the recycled water differs from the water Stone normally uses, Suydam said, "It's higher-quality water than what we use to brew. And we actually had to add minerals to it, to meet our brewing water quality requirements." Those requirements have to do with the water profile Stone and other brewers look for. In addition to hardness requirements, Suydam said, "We also have what we call a chloride-to-sulfate ratio." With all the filtration and processing the water undergoes, we asked Suydam if Stone would have been able to create an identical pale ale if it had been made from Stone's normal water source. "We try to," he said. "It's science and kind of some black-box stuff. You hope to get that with every water that you start with." Of course, the process of making beer also generates wastewater, from the brewing process to cleaning and packaging. In Stone's case, Suydam says, the company recycles all of its wastewater, amounting to about 100,000 gallons per day — or about 25 percent of the total amount of water used in the brewery. After it filters and treats the water, the brewery then circulates its own recycled water back into the building — but not into its brewing system. "We only use it for cooling, cleaning and our boilers, as well," Suydam says. Any water that's left over, he says, flows back to the city's pipes.